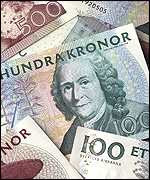 IP finance: What do you get for 60m kronor? Having just read on the IPKat about the sale of The Pirate Bay to Global Gaming Company for 60m kronor (£4.7m), I find myself wondering what sort of intellectual assets the purchaser is obtaining and how valuable they will prove to be. A couple of weeks ago I looked to see if The Pirate Bay had any trade marks. It didn't seem to have any registered and, if I recall correctly, its website indicated that consumers were free to do interesting and imaginative things to its logo and then send a sample back in order to show what they'd done. As for the software, my impression is that it was licensed in and was basically off-the-peg stuff. Its user database probably wouldn't be worth much, seeing as it consists primarily of people who are used to paying nothing for what they want. If anyone has any thoughts on the subject or, better still, hard facts, do please let me know. I think Jeremy that the site certainly has a great deal of value. They may not have any registered trademarks, but they certainly have a great deal of "brand value" and if I were their IP consultant I would certainly be advising them to invest a lot of money in trade mark registrations. Their brand awareness is extremely high - and the sympathy for the brand as a "rebel brand". Their database of name probably also a highly attractive demographic profile of younger people who can all be mailed in an effort to push them towards gaming. Agreed, the clientele are not those that want to pay for music or films - but gambling might well be different.